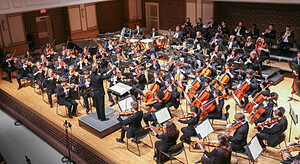 Brevard College will present a concert by the Symphony Orchestra of the University of North Carolina School of the Arts, directed by Christopher Lees, on Sunday, March 25, at 3 p.m. in the Porter Center for the Performing Arts. The concert is part of the College's Arts for Life: A Weekend Celebration. The concert will be the second performance Brevard College has hosted from the student orchestra and will feature two concerto competition winners, saxophonist Andrew Hasher and pianist Jacob Wang. Hasher will play the Concerto for Alto Saxophone by Henri Tomasi, and Wang will play Tchaikovsky's Piano Concerto No. 1. Conductor Christopher Lees said, "This exciting program showcases the breadth of student talent at UNC School of the Arts. From the orchestral virtuosity of Rimsky Korsakov's "Russian Easter Overture" to the colorful beauty of the Tomasi to the monumental expressive power of Tchaikovsky, it does not matter from which angle you look or listen, these students really are outstanding." Benefactors for this year's concert are Preston and Nancy Athey of Baltimore, Md. Strong supporters of both UNCSA and Brevard College, the Atheys also sponsored the 2016 concert, which featured a student concerto winner and guest organist Sarah Kraaz. General admission tickets to the concert are $20 for adults and $10 for children under 12. Brevard College faculty and students will be admitted for free with their college ID. "We are so honored to have this extraordinary group of performers come to Brevard College to be a part of our Weekend Celebration of the Arts," said Kathryn Gresham, head of Brevard College's Fine Arts Division. "It truly is the capstone for this event." For tickets, contact Cherie Tinsley in the Alumni Office at (828) 884-8218 or Cherie.tinsley@brevard.edu.